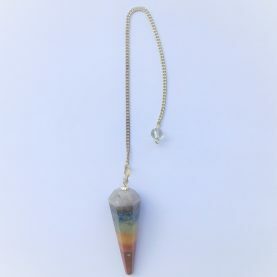 A crystal pendulum can be used to receive answers from the crystal devas. 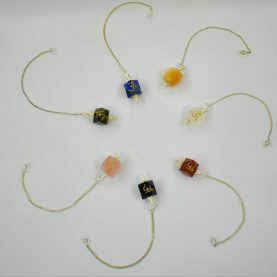 The pendulum acts as a receiver and transmitter of the guidance. 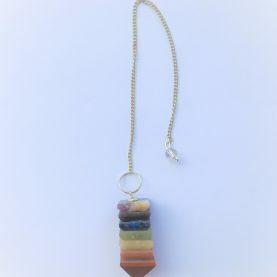 As the pendulum moves, you gain answers in response to questions. It is best suited to use to answer ‘yes’ or ‘no’ questions. You can request the pendulum to move in a certain direction to indicate the answer. 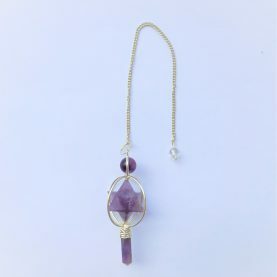 Crystal pendulums can also be for healing, cleansing and balancing chakras, and cleansing the energy or dispelling negativity in a room/space. 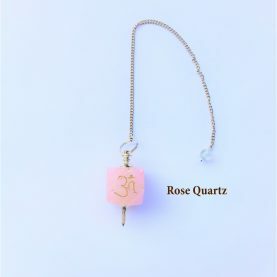 To heal a part of the body or to cleanse a chakra hold the pendulum above the body part/chakra and request the crystal deva to heal the body part or cleanse the chakra. The main criteria for receiving correct answers is to have a silent and open and doubt free mind. Any inclination towards an answer will affect the movement of the pendulum. 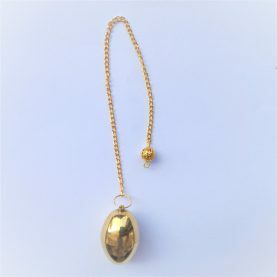 To use the pendulum, hold the top bead at the top of the chain between your thumb and forefinger and put forth the question/request. A golden colored metal vibhuti holder. Can be used to carry vibhuti.